The table below is the same one we first printed in the on-paper version of Farmnews back in 2001. Over the years we’ve had several requests for this table and we’ve had to hunt it out numerous times ourselves, so here it is. The figures are for lambs off grass with about 1kg of wool. 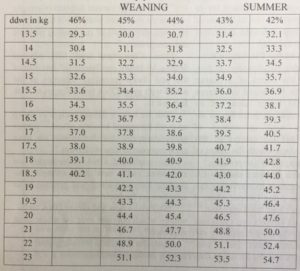 For example a 34kg lamb (if yielding at 44%) should weigh about 15kg on the hook. Some further adjustments are also necessary. They are: Ewe lambs +1%; Ram lambs -1%; Extra woolly -1%; 12 hour empty out +2%; Prime breed cross +1%.